Having listed this EXQUISITE AND SCENIC PRIVATE GAME RESERVE FOR AUCTION, A PRIVATE PARADISE, most suitable FOR A DEVELOPER or a HOSPITALITY DREAM, THE ON-SITE AUCTION will take place on 19 APRIL 2018 at 11h00. WATERS GAME RESERVE is an investment in which In2assets, the well-known Farm Sale Specialists foresee a magnanimous return. While some break away to the island, others break away to the bush. Very little evokes a sense of tranquillity as that of being at one with nature. This reserve is a unique go – to destination to be at one with nature, enjoy tranquillity, and or, engage in the plentiful array of activities on offer. GAME RESERVE offers a plethora of activities to enrich one’s soul. The vast uninterrupted expanse of +- 3 033 HA hosts the kind of breakaway designed by the nature lover himself. Located in the heart of KwaZulu -Natal Midlands, two hours’ drive from Durban and four hours from Johannesburg, it is accessible via road or air. Charter flights can be arranged from OR Tambo (Johannesburg) or King Shaka (Durban) direct to their private air strip. This malaria free zone offers a unique intimate interaction with the African Bush and the sweeping green plains of the Natal Midlands. 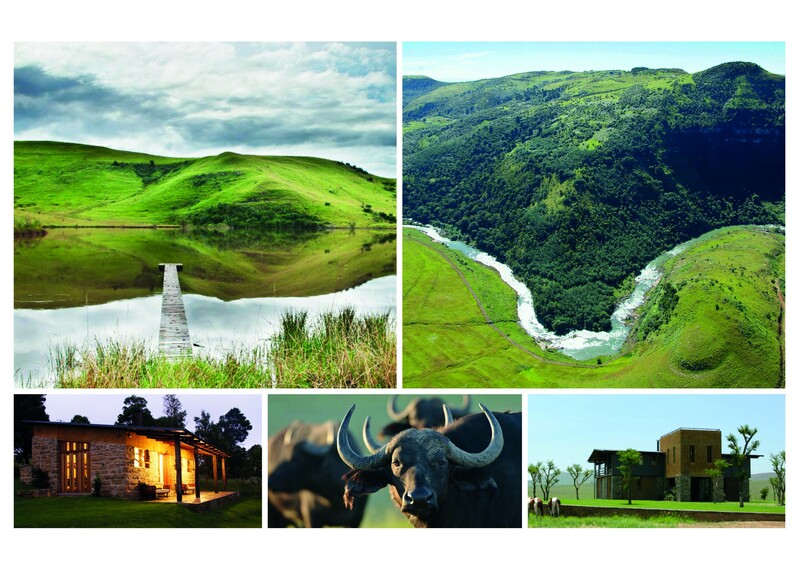 Far from the maddening crowd, ZULU WATERS GAME RESERVE offers guests a diversity of choice. One may choose to explore solo or alternatively, join a guided game trail. Reeling in Wild Trout in the 15km stretch of The Bushman’s River as well as absorbing the natural sounds of the blades of grass dancing to the music of the bush, are ways to destress and engage with nature in its purest form. Riding alongside the Wildebeest and Buffalo is an option for lovers of wildlife. ZULU WATERS GAME RESERVE offers the balance that one may vacillate between. Hot ballooning and guided walks to view the original rock art of the ancient San people in the nearby cave are options. It is here that one may romance the African Stone! Whatever one’s personal choice, this unique Game Reserve caters to the appeal for both adventure and exclusivity, making the experience unique and refreshing. Being in the cold eddies of a trout stream, in the saddle of a sure-footed Appaloosa or engaging in clay pigeon shooting are further activities on offer. Enjoying a game of tennis on the reserves own private piece of Africa, is a unique experience to partake in, especially in such a magnificent environment. For those who embrace and appreciate Wildlife, this Game Lodge is the perfect location, boasting an array of magnificent and majestic animals. ZULU WATERS GAME RESERVE is home to the Cape Buffalo. Over the years, viable populations of game have been reintroduced to the Reserve. The reserve provides the guest with the opportunity to enjoy large herds of elusive antelope at close quarters. The three accommodation options all boast their bespoke charm and splendour and unique beauty of the African Bush. Shaka Lodge offers a private chef who serves gourmet fare sourced from the reserve. Luxury is born here! Nandi House and The Lake Cottage are self-catering units but can be added to Shaka Lodge in the event of larger groups. ZULU WATERS GAME RESERVE indulges the community in this prestigious and magical location. It has a strong sense of Social Responsibility and a magnetic force of traction, involving the local community in various admirable ways. With such wide appeal, the prospective new owner can take over this pristine property and simply continue without revised changes. As an established income generating business, it is ready to step into. Thus, the acquisition of the most magnificent land and established business with on-site trained guides and first aiders, it is a matter of ready steady go! The trusted recommendations of the esteemed Commercial and Farm Specialists In2Assets, are certainly to be trusted for their knowledge and recommendations. This established property company specialising on property auctions has a strong foothold in the property market, one which focuses on Farm Auctions as well as Commercial & industrial Auction Sales. Andrew Miller the national Auctioneer and partner of In2assets will be conducting the auction. In2Assets have an excellent track record and have a wealth of experience to handle an asset of this magnitude. Auction Terms: R 50 000 refundable registration deposit. Strictly by bank guaranteed cheque. No cash.